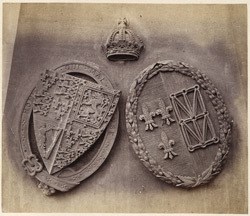 The seventh shields in the series comprise the "armorial bearings of King Charles I., France and England, quarterly, surrounded by the Garter, and marshalled with the arms of his wife Henrietta Maria, daughter of Henry IV., King of France and Navarre. This is in remembrance of the raising of the Royal Standard at Nottingham Castle, as well its subsequent gallant defence by Colonel Hutchinson against the King. These shields are surmounted by the crown, in the form in which it was worn by Charles I.